The index of my childhood memories contains countless references to the California Academy of Sciences. With three kids to entertain all summer, my mom was always game for a trip across the Bridge and into the Park. In addition, my grandmother was a member of the Academy, so babysitting with her usually took place in the company of curious penguins and herds of stuffed Ibex. I remember being a bit bored by African Hall, with its dioramas of lions and antelope. I wasn’t big on wildlife as a kid, although the two-headed snake was enough to pique my interest. My favorite corridor was around the corner. I have no idea what this area was actually named, but The Space Room was good enough at the time. There was a vast model of the solar system on the ceiling (including Pluto, thank you), a scale that could calculate your weight on every planet, a real sample of lunar soil, and the pièce de résistance: Foucault’s Pendulum. We were mezmerized by its rhythm, swinging from a long cable that seemed to disappear into the ceiling. We waited for what seemed like an eternity to see it to knock down a peg. In hindsight, the great peg toppling was something of a non-event. But when you’re eight years old, waiting fifteen minutes for anything made it the most amazing thing you’d ever seen. The Steinhart Aquarium was also popular with the Pritchard kids. To this day, my parent’s still refer to the entire Academy as “The Steinhart.” We were absolutely terrified of the giant alligator gars, and we ran circles through the dizzying round-about tank. Stepping out of the dark aquarium and into the atrium was a shock to the senses: the air was damp, light poured in from the ceiling, and every sound echoed off the tile floor and high ceiling. 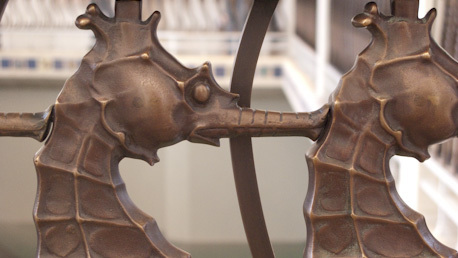 We would peer through the bronze seahorse railing at the alligators below, not totally convinced they were real. 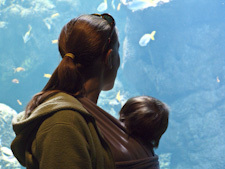 Lindsay was fascinated by the penguins, racing back and forth along the length of their tank. Scott and I took classes at the Academy’s learning annex in the summer. I remember watching my first controlled explosion in that chemistry lab. C3H5(OH)3+ KMnO4 = BOOM! I spent a good portion of the next five years trying to aquire a jug of Potassium Permanganate. It’s a good thing the internet didn’t exist yet. Today’s adolescent pyromaniacs have it so easy! In my cartography class, we made scale maps of the Park. This ignited an interest in maps and navigation that persists to this day. A geek was born inside those walls, and I can’t thank my parents enough for giving me those opportunities to learn. So the tradition continues with this generation. When the Academy shut its doors in 2003 for reconstruction, Jody and I laughed that “we might have kids” by the time it re-opens. As it turns out, Autumn was born around the time the Academy re-opened in September. We were so busy with our own little science experiment, that we had to put off our plans to visit for a few months. Today we made good on those plans and visited the new Academy. Autumn was awake through the African Hall (still pretty boring), but she nodded off soon after we saw the penguins. We made our way around the ground floor and through the aquarium below. We visited the Early Explorers Cove, where Autumn delighted us with her first genuine laughs. We finished our first visit with trip to the rooftop garden. We didn’t get a chance to see the Rainforest or the Planetarium, and I think we only saw about half of the labrynthine aquarium. We chose to get a membership, so we’ll be returning soon (next week) to resume our explorations. It’s never too early to inspire another generation.